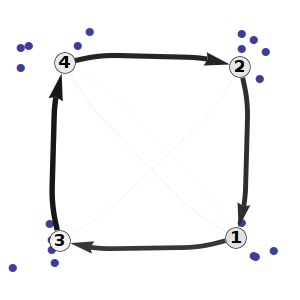 A Clockwork RNN [14c], a simple yet powerful modification to the simple RNN (SRN), in which the hidden layer is partitioned into separate modules, each processing inputs at its own temporal granularity, making computations only at its prescribed clock rate. It reduces the number of SRN parameters, improves the performance significantly in the sequential tasks, and speeds up the network evaluation. It has been shown experimentally, that it outperforms LSTM [Hochreiter-1997] in audio signal generation and TIMIT spoken word classification. The goal of sequence generation task is to train a recurrent neural network, that receives no input, to generate a target sequence as accurately as possible. The weights of the network can be seen as a (lossy) encoding of the whole sequence, which could be used for compression. 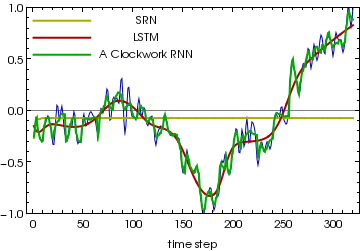 SRN tends to learn the first few steps of the sequence and then generates the mean of the remaining portion, while the output of LSTM resembles a sliding average, and CW-RNN approximates the sequence much more accurately. Temporal Hebbian Self-organizing Map [7b,8a] is a recurrent extension of Kohonen's SOM. Additional layer of full recurrent connections among the nodes is trained in a Hebbian way. The connections accumulate first-order statistics of transitions between states represented by the neurons, while placing the neurons into centroids of clusters using the input connections. 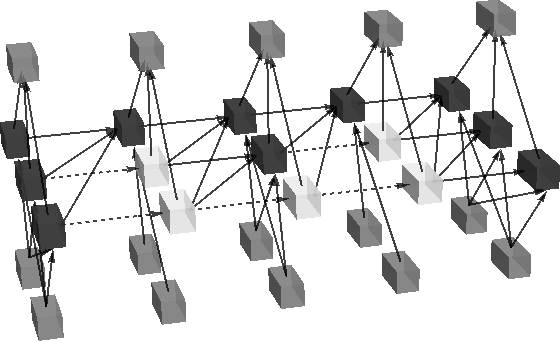 The network clusters the data in both input space and time. The initial THSOM model Hebbian training was improved by [Ferro et al.] introducing neighborhood in the temporal connections (Topological THSOM). The network was further extended for unsupervised learning of a model in RL and named Temporal Network for Transitions (TNT) [11a].